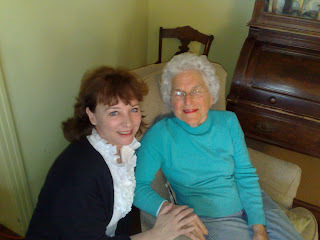 My mother's dearest friend was Betty McGehee of Natchez. Miss Betty (we children were allowed to call her that after years of knowing her) lives on a big farm with horses, cows and chickens. We always loved going out to the McGehee's and riding their horses and getting a taste of the country life. We saw Miss Betty twice during our few days in Natchez. She let me pick fragrant daffodils from her garden and put them in a can with some water, and we drove around Natchez with those flowers in the cup holder of the car for the next couple of days and I was constantly reminded of her. 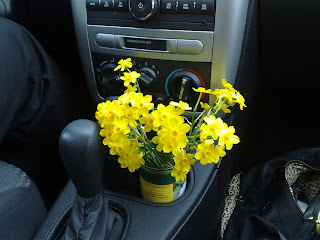 When I was young and living in Natchez, Miss Betty had an idea to pick daffodils from her vast acres of them and put in decorated cans to give to shut-ins -- elderly people who couldn't get out of the house -- to cheer them. But I was so intimidated by them when I tried to take them flowers that I forgot to put water in the can so the flowers would have been dead quickly. I finally confessed this to Miss Betty, and she laughed and we re-created the daffodils in the can, only this time I put water in them. On our second visit yesterday, we sat on the rocking swing on her front porch and talked about my mother and the guilt I had over her life (she was in a home with Multiple Sclerosis while I was living in England raising kids so I wasn't there for her except for yearly visits). Miss Betty tried to help me by telling about some of her private guilt that she was dealing with, then we both started crying, and it was cathartic. Then she loaded us down with pecans from her trees, homemade lemonade and more daffodils in cans, and basically we agreed that she was my mother now that my own mother is dead, and the whole visit was a beautiful experience. 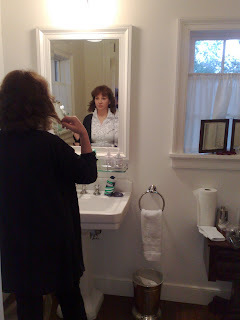 I have to show you this photo Mel took of me getting ready to go out at the antebellum home we were staying in. I was sooo nervous, not knowing what to expect from Natchez -- would it deny me its magic or open its arms to me? And it came through for me. Thank you Natchez. Ms Betty is a beautiful human being. To know her is to love her.